Hashtags was first used in twitter and now many users use it on facebook which is the biggest social network, allowing users to quickly see what other people are saying about it. Facebook is also making hashtags searchable, even if they originate on different services, such as Twitter, Tumblr, Pinterest, Google+ and Instagram. From the Hashtag feed you can also compose posts directly. Using Facebook hashtags can help expand your post’s reach, which is now more important than ever considering Facebook’s algorithm changes have resulted in a smaller and smaller reach for posts published by business pages. In addition to this, adding hashtags to your posts on Facebook can also help you to connect with your target audience. You can use them to discover and join conversations with people who are talking about your business, or about a topic related to your niche industry. It can also make your posts easier to discover when people are searching for a specific topic. Clicking a hashtag on Facebook will bring you to a separate page with posts that are visible to you based on the various users’ privacy settings. You’ll also see the different #trendingtopics in the top right hand corner of your News Feed. Hashtags in Facebook turns topics and phrases into clickable links in your posts on your personal Timeline or Page. This helps people find posts about topics they’re interested in. Anyone can make anything into a hashtag by adding a # in front of a word, acronym or phrase with no spaces. On Facebook, this is no different. As soon as you use the # symbol a blue box will appear over your tag. Then click Post. Your tag will appear in bold within your status update. It is important to remember, however, that this system is a simple form of organization, and can often run amok. For instance, I can say #thingsididwheniwassevenonmybike, but how often will I ever use that hashtag? If the answer is never, it’s probably not a great hashtag to use. To find out if a hashtag is trending there are a couple of websites worth checking out: www.hashtags.org and hashtagify.me. After your post is up, you can click on your new tag to see who else is using that same phrase and what they are saying. For instance, clicking on #Hashtag brought up separate feed from my News Feed with a list of people’s posts; some of whom we know and others we do not. Within this same feed, you can click on your Status bar to have that same hashtag automatically added to an update. Facebook is tracking those hashtags people are using, so a feed is always available even if you’ve not previously used the tag in a Facebook status update of your own. Simply type the tag of your choice, such as #cats, and click the page labeled Hashtag. This will open the same feed of related posts as you would get if you clicked on a hashtag in a post. Keep It Relevant – use hashtags only when relevant to your post. Keep It Simple – Less is more. If you want to start a cool hashtag for people to use, go for one or two words or an abbreviation. Say you want to promote your favorite cartoon character, Ren and Stimpy’s Powdered Toast Man. You might not want to go for #PowderedToastManRenStimpy. A way better option would be something like #PTMChar. Keep It Obvious – A lot of folks simply skip searching existing tags before coming up with their own hashtags. As such, they just write the hashtag they expect others to be using. You want those people to also be part of your conversation. use it for branding – Keeping your hashtags based on your brand, product or show’s name is usually your best bet. Also, check to see that the hashtags won’t end up hurting your PR efforts #susanalbumparty-style than helping. Don’t Spam – Using too many hashtags in a single update or comment might leave you wondering why nobody loves you. That’s because you’ll be seen as a spammer. Studies show that, at least on Twitter, tweets with one or two hashtags receive double attention, while tweets with more than 2 hashtags receive 17% less engagement. 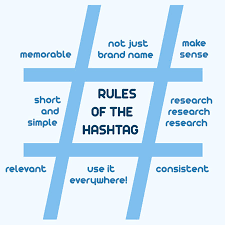 Define Your Hashtag – When first posting a tag for a conversation, it’s good practice to define it. Let people know what the hashtag is about. Describe it in simple words. You can also define it here if you want to be thorough. Hashtags are a great invention. We should be happy that Chris Messina (inventor of hashtag) came up with this insanely awesome idea. We hope that this 101 guide about hashtags in facebook will be able to help you use it correctly.